Great news folks! A new software update has been released that improves performance and adds new features. Below, I describe the updates and how they help you scout Amazon.com more efficiently for profitable products. No# of Reviews: The number of Amazon.com customer reviews that a product currently has. Avg Review Rating: The average Amazon.com review score (out of 5 stars) that a product has. If you are an Amazon.com seller, this new data provides another useful metric to further analyze your potential product’s performance. Personally, I find the Avg Review Rating especially useful. I use this to quickly weed out products with low review ratings (less than 3 star). Conversely, if a product has 4-5 star Review Rating and 10+ No# of Reviews, it’s a great indicator of the product’s popularity with Amazon.com customers. Two new options are now added under Settings/Misc. tab. 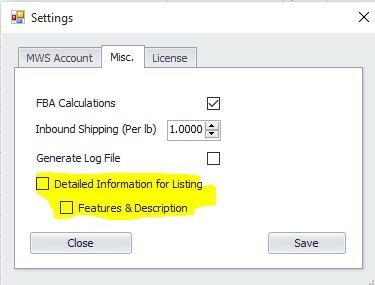 These options will enable/disable certain resource intensive data collection. In other words, you now have the choice to leave these off to improve speed/performance. If you use these? No sweat, enable them. Detailed Information for Listing: This feature will populate “Manufacturer”, “Brand”, “Version” and “Is Amazon Selling” columns in the results. If these fields are not useful for your analysis, keeping this feature un-selected will result in faster performance. This feature is not selected by default. Feature & Description: This feature will populate the “Feature” (3-4 bullet points for product from Amazon.com’s product listing) and “Description” columns in the results. If these fields are not useful for your analysis, keeping this feature un-selected will result in faster performance. This feature is not selected by default. In addition, we also made other less visible updates behind the scenes to help with system performance and memory utilization. In simple terms, the program will now run faster with more stability than ever before. We hope you like these updates, more to come soon!